An aging and surveillance contract as specified by NGIS is not seen as production as per this report’s methodology. However, the activities of NGIS as described in its whitepaper are decommissioning the tested components only and not the remainder of the US arsenal of CBU-87/B. The subsequent reporting by NGIS provides the US Air Force with knowledge about their stockpile. 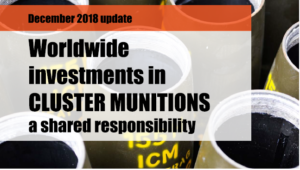 This can be seen as assistance with the stockpiling and/or retention of cluster munitions, which is a prohibited act under the Convention on Cluster Munitions. NGIS should cease all involvement with cluster munitions as soon as it can and where possible not renew existing contracts. We call on Northrop Grumman to fully end its involvement with (key components of) cluster munitions to the extent that it is prohibited by the Convention on Cluster Munitions as soon as possible. We also call on investors in Northrop Grumman to engage with this company to make it sever all its involvement with the continuation of stockpiling of cluster munitions. Since the acquisition by Northrop Grumman of Orbit ATK was not yet completed when the financial research for this report was closed, we will list investors in Orbital ATK in an Appendix to this report. [i] Northrop Grumman, “Northrop Grumman Completes Orbital ATK Acquisition, Blake Larson Elected to Lead New Innovation Systems Sector”, Northrop Grumman website (https://northropgrumman.gcs-web.com/news-releases/news-release-details/northrop-grumman-completes-orbital-atk-acquisition-blake-larson), last viewed 2 July 2018. [ii] Textron, “Q4 2017 Earnings Call Presentation” , 31 January 2018, Textron website (https://investor.textron.com/investors/events-and-presentations/default.aspx), last viewed 16 November 2018.